Below you will find a detailed step-by-step tutorial on how to setup and use Wiremo Badges. 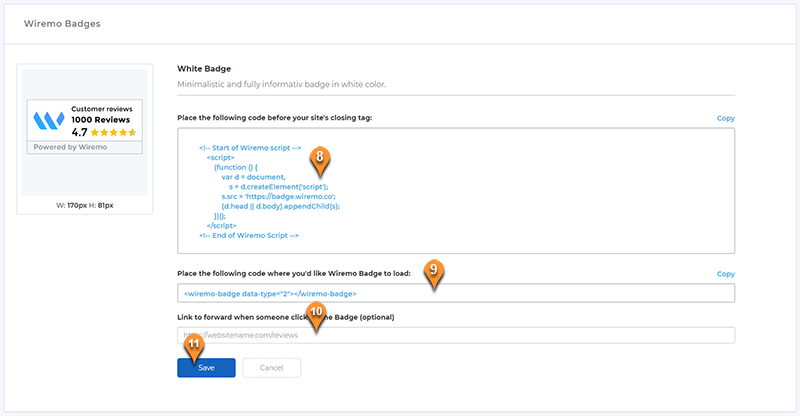 As with any other features at Wiremo, our Badges are very easy to setup and use. Select the badge you like the most and click on it or on the "Edit" option. Below find setup instructions for your preferred badge. Beautiful and friendly, with a dynamic design that will be changing automatically once you'll get more reviews. In the image below you can see that there are 5 main designs of our Dynamic Badge available for: 0 to 50, 51 to 100, 101 to 250, 251 to 500 and over 500 customer reviews. You can see them all on the setup page by clicking on the arrows under the badge's preview (pin 2). Don't forget to choose your badge size (pin 3). You can choose between 5 different sizes: 125px, 135px, 145px, 155px and 165px. Now to setup the Dynamic Badge on your website copy the badge's script (pin 4) and paste in the page where you want the badge to appear. Then copy the second, short code (pin 5) and paste it exactly in the place of the page where you want your badge to appear. Also, you have an optional feature to add a link for your badge. For example, it could be a link to your customer reviews or pricing page. Once you're done press Save and check if the badge is loading well on your website. Both, White and Yellow badge have the same setup features so it's more simply to gather them into one instruction block. Also these two badges have a predefined size and design. We've tried to make them as simple as possible and at the same time informative and beautiful. All you have to do is to copy the badge's script (pin 8) and paste in the page where you want the badge to appear. Then copy the second short code (pin 9) and paste exactly in the place of the page where you want your badge to appear. Same as for our Dynamic Badge you have the possibility to add a link for you badge (pin 10). Once you're done press Save and check if the badge is loading well on your website. That's all. Simple and beautiful. Thank you for choosing Wiremo.